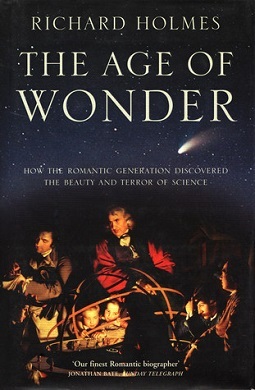 The Age of Wonder: How the Romantic Generation Discovered the Beauty and Terror of Science is a 2008 popular science book about the history of science written by Richard Holmes. In it, the author describes the scientific discoveries of the polymaths of the late eighteenth century, and describes how this period formed the basis for modern scientific discoveries. It won the 2009 Royal Society Prize for Science Books, the 2009 National Book Critics Circle Award for General Nonfiction, and the 2010 National Academies Communication Award. Holmes focuses particularly on the lives and works of Sir Joseph Banks, the astronomers William and Caroline Herschel, and chemist Humphry Davy. Other profiles include African explorer Mungo Park. There is a chapter on the early history of ballooning including pioneers Jean-François Pilâtre de Rozier, Vincent Lunardi, Jean-Pierre Blanchard and James Sadler. He also describes the relationships between the scientists of that time, and the early days of the Royal Society. "Its heart – the linked stories of Banks, Herschel and Davy – is thrilling: a portrait of bold adventure among the stars, across the oceans, deep into matter, poetry and the human psyche"
This page was last edited on 24 February 2019, at 10:02 (UTC).